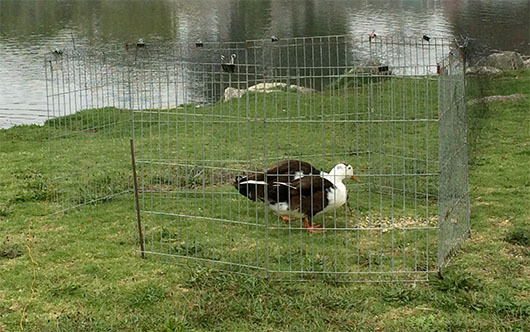 This weekend we collected two domestic ducks that had been abandoned at Westlake Park in Santa Cruz. The ducks were not being maintained - fed a proper diet, and they were aggressive towards wild waterfowl. On our initial visit to assess the situation, we found the two black and white ducks together, foraging along the shoreline of the small lake. From their coloration and upright carriage, we believe they are Magpies - a fairly unusual breed of domestic duck. The Magpie duck is believed to have originated in Wales in the early 1900s, and was first imported to the United States in 1963. The two ducks were a bit skittish, as though they had been chased, or perhaps someone had tried to capture them unsuccessfully. It took a few days before we were able to collect them. They were transported to the local animal shelter where they will be fed and cared for until they are adopted. Magpies are a hardy variety of domestic duck, living approximately 9-12 years. They are good layers, producing over 220 eggs annually and they are active foragers, eagerly consuming slugs and snails and insects. A great addition to a home farm. 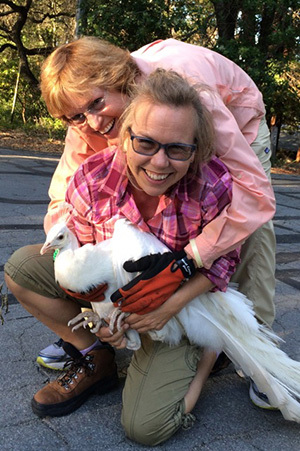 This week, HWC was called to collect two un-owned Indian peafowl from a quiet residential area in the hills above Soquel, CA. The Indian peafowl is found in the drier lowland areas of Sri Lanka on the Indian subcontinent. It has been introduced to many parts of the world by collectors and often, as in this case, they are allowed to roam freely, establishing feral populations. The two males - one white and the other sporting the standard metallic blue-green colors, wandered into the rural subdivision a few weeks ago, and stayed. With their loud calls at dawn and a bad habit of hopping onto parked cars, their presence soon became a nuisance. the peacock as it's carried to the transport vehicle. On Monday, we successfully captured the larger peacock. The younger, white peafowl was more skittish and elusive. Yesterday, however, we were able to bait the bird close enough to capture. 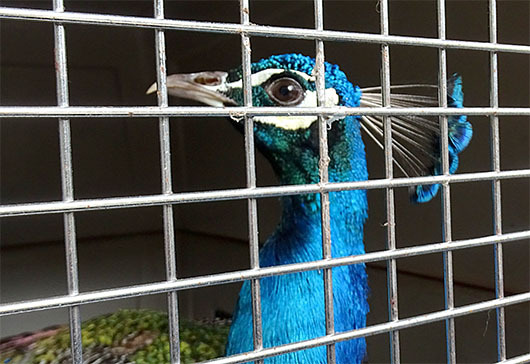 The birds were transported to Santa Cruz County Shelter where they will be available for adoption. By the time we're contacted, a coyote has often become a problem - there's been a loss or there's fear of an imminent attack. The animal is a perceived threat that must be removed without delay. When it comes to coyotes, we find people are usually set in their misbeliefs and are far less willing to change their habits than with other species - less willing to adapt to living with these animals as part of their environment, less willing to invest in making modifications to their property even if that is what will solve the problem, yet, they are often quite demanding that something be done, admonishing local officials for not taking action to protect their home, family and pets. For these people, we offer the Coyote Challenge. The Coyote Challenge is our pushback to those who believe nothing less than lethal control will work. The Coyote Challenge is also a way for us to help those who truly cannot afford to invest in non-lethal control measures. In return, participants agree to share their account of the process - and the results - which we expect will be that their coyote problem has been resolved, for good. 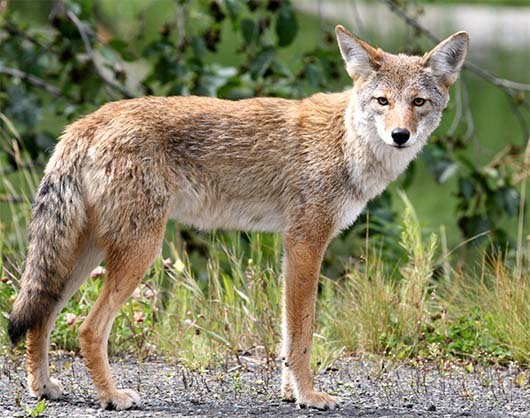 With each challenge being documented from beginning to end, we see this as a great opportunity to help people and coyotes while gathering conclusive evidence that non-lethal control methods do work. The Coyote Challenge officially launched last month and we have 3 applications in the review process. We will be donating our time but supplies, equipment and associated travel costs will be covered through a fund that has been set up through Wildlife Emergency Services. 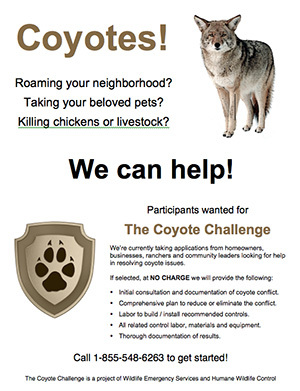 To apply for help through the Coyote Challenge, email help@humanecontrol.com or call 855-548-6263. Click the Donate button below if you'd like to contribute toward the fund that offsets the cost of equipment and such.